t*rexes and tiaras: The day they paved the parking lot.. This is such a simple outfit for me, but I do really like the way this dress turned out. I've worn it a couple of times already, which considering I only made it on New Year's Day, is pretty good going for me. I'm often guilty of wearing things once and then forgetting about them. These heels are a pair I've had for years - in fact, the receipt is still in the box with them, and apparently I bough them in 2006. They've seen a lot of wear over that time, so I guess that means they're up there with the best value pairs of shoes I've ever owned. I'm trying to make an effort to improve my photos and to find a better photo location, hence all the different locations. I'd thought that this screen would be a cute background, but I'm not sure it's tall enough. Hopefully, I'll manage to find time for camera-shopping this weekend, I think I have my heart sent on a Canon 1100D, which seems to be one which a lot of people have recommended to me. In giveaway news, thank you so much to everyone who entered the Bonne Chance giveaway. That's now ended and I can announce that the lucky winner is: Hannah (@cutesandfruits). I've got another giveaway idea; I'm just waiting for the prize to be delivered to me, so watch this space! Thanks, after getting some stick for my photos, I thought it was time to try something a little different. Yeah I like it with the screen in the background. I miss my old background for photos, but I can't take them in my room anymore because the light is blocked out by...a mountain of shoe boxes (no idea how they got there?! ), so I've been a little bit all over the place for the past couple of years. Be glad once my shoe room is complete and I can take decent shots in there. Never seen those shoes before, your dress is lovely. Thank you - I definitely know what you mean; sometimes I get so annoyed about the lack of space, but I can't really part with anything, so aaargh. Love the dress and those shoes are fab! Oooh, your flat is soooooo exciting! I just want to take everything off the shelves and examine it!!! The bunting is so cute as is the screen! I will write more posts about the knick knacks, soon! Yep, it's annoying me - a couple more inches would probably do it. Thanks I think I will try it for a little while, anyway. Have fun shopping for the camera. Thank you, I think I need to go and play with some. Oh gosh, no way! I am nowhere near talented enough for that! Thanks, it was such a lucky find - £2.50 in a charity shop for the pair of curtains! 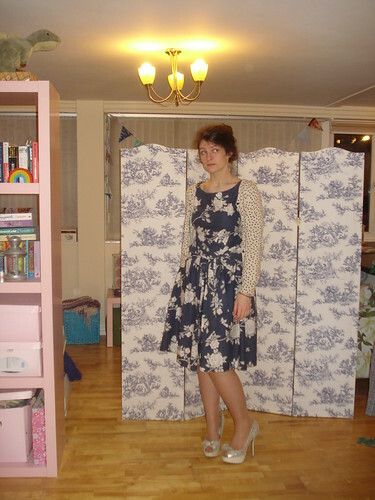 This dress is amazing, you and Sarah are really inspiring me to make time to attempt to make my own! 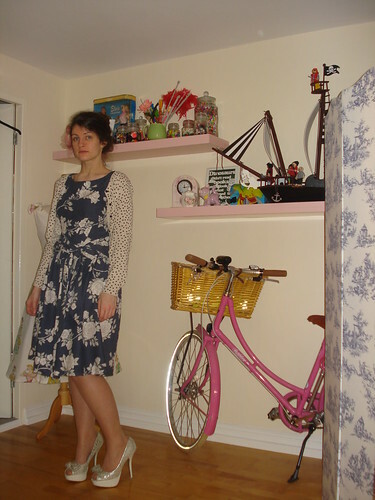 I love the screen as a background but I think I prefer the shelves and bike, it has that quirky edge to it! Aww, defintely give it a go :) I can't decide, but I definitely think less-cluttered photos are a step forward. I'm set on the 1100D I think, just have to order one and then learn how to use it!